CD review: "Two Men With the Blues"
Willie Nelson singing the blues isn't all that surprising  the country music icon has recorded just about everything under the stars in his storied career, including a reggae album in 2005. Nor is jazz standards standard-bearer Wynton Marsalis coupling with Nelson that much of a surprise; Marsalis may have a reputation as an inflexible purist, but you can't grow up in New Orleans without absorbing at least some of the Crescent City's gumbo spirit. What is a surprise here is the absolute musical empathy that's immediately apparent between Nelson and his harmonica player, Mickey Raphael, and Marsalis' jazz quintent on this live set. The seven men play with the loose joy of a band of long standing, despite the fact that this was a special, two-day engagement. The empahsis is on Nelson's vocals, and in this jazz and blues vein, he sounds not a little like Mose Allison. Nobody will ever confuse him with Bing Crosby on "Stardust," nor his late pal Ray Charles on "Georgia On My Mind." But if Nelson's voice is thin and reedy, and always has been, he's also always countered any physical limitations with a sparkling charm in his singing, and he's on top of his form here. Considering that Marsalis' combos only but rarely back vocalists, their ability to provide a supple, warm foundation for Nelson's singing is impressive. With a set of standards ("Basin Street Blues," "Ain't Nobody's Business") and old-timey songs ("My Bucket's Got a Hole In It") sandwiching classic blues tunes ("Caldonia," "Rainy Day Blues," "Bright Lights, Big City"), the quintet-plus two adopts the feel of a New Orleans brass band here. 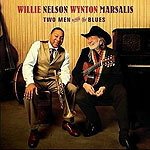 Marsalis himself punctuates Nelson's singing with gorgeous fills and solos on trumpet, while Willie strums along on his acoustic guitar. It has the relaxed feel of a pair of old friends sitting around the porch playing favorite songs to wile away the time. That tape was rolling while they played is our good fortune.